This book is the reason that I believe in mentoring, along with my personal experiences. It tells a simple true story of how one young man has hit his lowest moment in life. When he saw only darkness in his life, a man named Malcolm sheds some light on it. 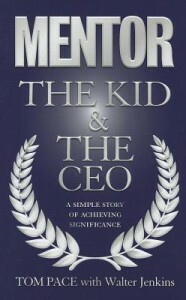 After being mentored for some time, the young man ends up extremely successful later in life. Being able to work with others and use other peoples experience is a great way to skip a lot of trials and tribulations. Often it seems so ordinary to believe you know so much more than what you really do about certain things. Then, after you fail once or twice you give up in frustration thinking this task or goal is impossible. People that embark on the climb to success, pushing through all kinds of failures, never go by themselves. If you would like to see how one mans story of mentoring can effect your life, visit www.mentorhope.com and achieve significance. This week has been so amazing and impacting! I’ve begun mentoring another person in my life. Through my job of publishing our book I get the opportunity to help all kinds of people across the US. Being able to see growth in the seed I plant when I offer a helping hand to others is an indescribable feeling. Just like the feeling the man feels in this video I stumbled upon showing how mentoring can work https://www.youtube.com/watch?v=kFvu1tC0u6Y. It is in a different language with subtitles, but this is a perfect example of how this mentoring thing works. I hope everyone finds the video as uplifting as I do. I wish all of you a terrific weekend and challenge you to think about who you could be mentoring in your life. And remember, it’s not about what you can get out of a relationship but what you can put in.